We’re men; buying a new big piece of machinery for your shop is a thrill. It’s a new toy, something to awe over. I recently purchased a new table saw, and I took delight in comparing one saw to another, combing thru user reviews, looking for the best price. These tools can cost a heck of a lot of money (are you listening, Fein? ), so you want to spend your money wisely. This problem is compounded, however, if you are buying big power tools for a production shop – or, if you are just getting starting into producing pieces by the lot. At this point, the machine in question is no longer a toy so much as it is an investment in your business. Ideally, machinery you purchase must either either increase the efficiency or the quality of the process being performed, preferably both. You don’t necessarily have to go out and purchase the most expensive machine, either. 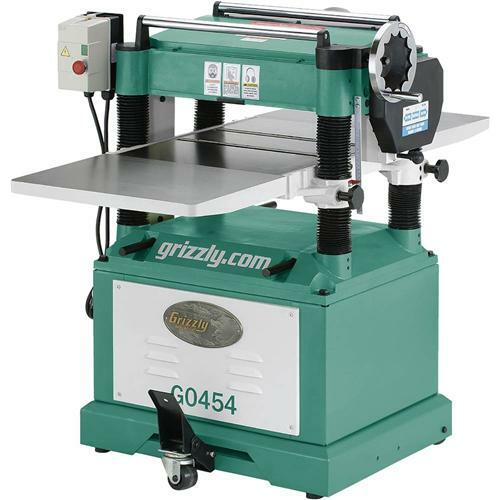 As cool and amazing as it would be to have, Grizzly’s G03X 25″planer, at $10,350, it would be way more then I would ever anticipate using. Instead, something like their G0454 20″ Planer at $1,774 would be more appropriate. This is really a lesson in value; paying some $9,000 more wouldn’t give me more for my money then the smaller size model. If I was planning to go into kitchen cabinetry as a business…well, that might be a different story. Of course, the flip side of this is you don’t want to buy the smallest and cheapest brand either (hello, Harbor Freight Tools). You need a dependable brand, and one with the capacity you anticipate, and the quality you require. As a general rule of thumb on these things, I make a choice on a product line (as in the Grizzly example above), taking into account the anticipated work I’ll be doing – and go one model larger (assuming that’s not a huge jump in price and capacity; I don’t want to go from a $2,000 20″ planer to a $6,000 24″ planer). This way, I figure I add a little elbow room for anticipated need. What is my anticipated need for this machine? Will I ever be running a 24″ wide piece of wood through it, or will 20″ be all I’ll ever need? What kind of finish quality can this machine provide, and will that be enough? Does this machine add efficiency to my operation? Is the extra cost worth that efficency? Is this a quality machine? Is the maker reputable, the machine durable, the reviews on it favorable? So get busy and start doing your homework!